I can’t help being intimidated by these teens. 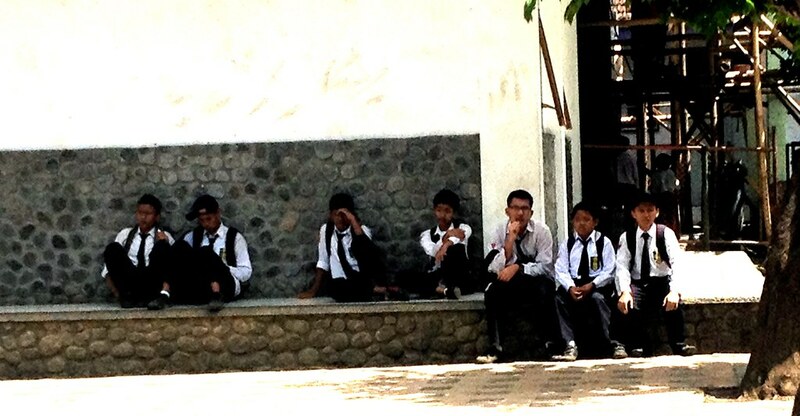 This week we started teaching practicum in a real Indonesia school. The volunteers in my village and I walked into a madrassah—an Islamic school maintained by the Ministry of Religious Affairs. Although, I have never walked into a prison, I imagine that that was what it feels like. Not because it was gloomy and oppressive. On the contrary, the school was rather big and nice; however, it was crawling with children of all ages and sizes and most lined the five floors of the white building and stared at us screaming “Bule!” (the Indonesia slang term for foreigner – i.e. : Gringo). The elementary school and the junior high school are on the same grounds and so there are hundreds of children ranging from ages 5 to 15. All junior high school students in Indonesia are required to take English language courses and thus, we will be working with the two Indonesian English teachers for the next couple of weeks. That’s two English teachers for about 400 students in junior high school alone. The children heavily outnumber the adults and because there seems to be a lack of authority, I’d say the children own the school. We were asked to arrive at school at 6:30am, which is when all students begin by reading and writing the Koran. At about 7:10, Mike and I sat through our first Indonesian English class, in which we were the main focus. The teacher didn’t demand much from his class and thus, we walked around answering questions he had written out for the students to ask. After sitting through our second class—in which we solely observed and didn’t participate in any way— it became clearer to Mike and me why the children were so behind. The class was total chaos. The 32 children in the classroom were constantly talking loudly, moving around, shoving each other and playing, yet the teacher didn’t seem to notice. She whispered an inaudible greeting, preceded to write (incorrect!) English sentences on the board and for the next 90 minutes, students were supposed to complete the five sentences. At the very end, she picked a few students to read their sentences in front of the class in return for a snack (although no one listened and kept talking). Mike and I were completely appalled. Neither of us has ever seen a classroom this disorganized and unruly. Out of all the challenges I’ve had so far in the Peace Corps, this has been the hardest. I left that classroom having a little existential crisis because these children lack both the proper environment to learn and the motivation. If all Indonesian students are conditioned to this sort of education, these will be two very difficult years. Although I am slightly disheartened this week, on the other hand, I was looking to be challenged…so here it goes. Tags: education, Indonesia, peace corps, PST. Bookmark the permalink. Previous post ← Losing Life Skills? I won’t lie, this will continue to be a challenge for you, but you will find ways of instilling discipline or adjusting to the chaos. Don’t let practicum pull your motivation down. These are students that you will only work with for a few weeks, but your kids at site will adjust to you. They may never be model American students, but you will definitely see improvements. On the bad days the rest of us PCVs have your back and you are free to call us and rant all you want. I found it helped to process why things are the way they are instead of overwhelming myself with the differences. At least this way you can come up with some possible solutions for the future. Thanks Allison! I will keep this in mind and I’m saving your phone number on my phone!
! Sounds hard! But I am sure you will be a great teacher! I appreciated reading this Melanie! With 10 to 20 students per class, our practium school seems a lot different than how you described your school. I have the feeling that you’re getting a more realistic glimpse of what permanent sites will look like. Our first weeks trying our roles as Indonesia teachers was bound to be interesting!